Davies, H.T., Philips, B., Preston, J. & Stones, S.R. (2019). Making research central to good paediatric practice. Archives of Disease in Childhood 104(4): 385-388. Doi: 10.1136/archdischild-2018-315117. Sherratt, F.C., Roper, L., Stones, S.R., McErlane, F., Peak, M., Beresford, M.W., Foster, H., Ramanan, A.V., Rooney, M., Baildam, E. & Young, B. (2018). Protective parents and permissive children: what qualitative interviews with parents and children can tell us about the feasibility of juvenile idiopathic arthritis trials. Pediatric Rheumatology 16: 76. Doi: 10.1186/s12969-018-0293-2. Sheridan, R., Martin-Kerry, J., Watt, I., Higgins, S., Stones, S.R., Horton Taylor, D. & Knapp, P. (2018). User testing digital, multimedia information to inform children, adolescents and their parents about healthcare trials. Journal of Child Health Care. Doi: 10.1177/1367493518807325. Alunno, A., Carubbi, F., Stones, S.R., Gerli, R., Giacomelli, R. & Baraliakos, X. (2018). The impact of fibromyalgia in spondyloarthritis: From classification criteria to outcome measures. Frontiers in Medicine 5: 290. Doi: 10.3389/fmed.2018.00290. Waite-Jones, J.M., Majeed-Ariss, R., Smith, J., Stones, S.R., Van Rooyen, V. & Swallow, V. (2018). Young people’s, parents’, and professionals’ views on required components of mobile apps to support self-management of juvenile arthritis: Qualitative study. JMIR Mhealth Uhealth 6(1): e25. Doi: 10.2196/mhealth.9179. Foster, H.E., Minden, K., Clemente, D., Leon, L., McDonagh, J.E., Kamphuis, S., Berggren, K., van Pelt, P., Wouters, C., Waite-Jones, J., Tattersall, R., Wyllie, R., Stones, S.R., Martini, A., Constantin, T., Schalm, S., Fidanci, B., Erer, B., Dermikaya, E., Ozen, S. & Carmona, L. (2017). EULAR/PReS standards and recommendations for the transitional care of young people with juvenile-onset rheumatic diseases. Annals of the Rheumatic Diseases 76(4): 639-646. Doi: 10.1136/annrheumdis-2016-210112. Majeed-Ariss, R., Baildam, E., Campbell, M., Chieng, A., Fallon, D., Hall, A.,McDonagh, J.E., Stones, S.R., Thomson, W. & Swallow, V. (2015). Apps and adolescents: a systematic review of adolescent’s use of mobile phone and tablet apps that support personal management of their chronic or long-term physical conditions. Journal of Medical Internet Research 17(12): e287. Doi: 10.2196/jmir.5043. Lunt, L., Adams, N., Stones, S.R. et al. (2019). Introduction: Young People Have Their Say. In: McDonagh, J. & Tattersall, R. (eds). Adolescent and Young Adult Rheumatology in Clinical Practice 1st edition. Cham, Switzerland: Springer International Publishing. Doi: 10.1007/978-3-319-95519-3. Douglas, S. & Stones, S.R. (2018). Foreword: Parent and young person involvement in research—a consumer perspective. In: Foster, H.E. & Broagn, P.A (eds). Paediatric Rheumatology 2nd Edition. Oxford, United Kingdom: Oxford University Press. Doi: 10.1093/med/9780198738756.001.0001. Stones, S.R. (2018). Young people get arthritis too. Biological Sciences Review 30(4): 2-5. Stones, S.R., Costello, W., Nikiphorou, E. & Peat, G. (2019). Like, Retweet, Repeat: The use of social media in healthcare, illustrated by three stakeholder perspectives. Children’s Research Digest. Available from: http://childrensresearchnetwork.org/knowledge/resources/social-media-healthcare. Stones, S.R. (2018). Nothing about us without us: The importance of involving young people in healthcare research, from the bench to the bedside. International Journal of Pharmaceutics 536(2): 524-525. Doi: 10.1016/j.ijpharm.2017.08.058. Stones, S.R. & Smith, J. (2018). Social media supremacy: a force of change paving the way for the next generation of healthcare and research. Evidence-Based Nursing 21(1): 2-3. Doi: 10.1136/eb-2017-102846. Stones, S.R. (2017). Making the dream a reality: the evolving landscape of family-focused research inspired by empowered patients and their families. Journal of Family Nursing 23(3): 307-318. Doi: 10.1177/1074840717716986. Stones, S.R. (2017). Social media sites that encourage peer support among young people with rheumatic conditions – Web review: Arthur’s Place. Nursing Children and Young People 29(4): 16. Doi: 10.7748/ncyp.29.4.16.s18. Stones, S.R. (2017). Social media sites that encourage peer support among young people with rheumatic conditions – Web review: Your Rheum. Nursing Children and Young People 29(4): 16. Doi: 10.7748/ncyp.29.4.16.s17. Stones, S.R., Milnes, L.J., McGowan, L. & Swallow, V.M. (2017). Self-management interventions for children aged four to 11 living with long-term, chronic conditions and their families: a realist synthesis protocol. PROSPERO 2017: CRD42017055884. Available from: http://www.crd.york.ac.uk/PROSPERO/display_record.asp?ID=CRD42017055884. Stones, S.R. (2019). The self- and shared-management of juvenile idiopathic arthritis by children, young people, families and professionals involved in their healthcare and education: Reflections from a patient-led, realist evaluation. Rheumatology 58(Suppl 3):113-114. Doi: 10.1093/rheumatology/kez108.085. Stones, S.R. (2019). The patient and physician interaction in social media. Rheumatology 58(Suppl 3):7. Doi: 10.1093/rheumatology/kez109.039. Chari, D., Wooley, K., Gordon, M., Schuler, K., Stones, S.R., Wadsworth, A.C., Matthews, P. & Arnstein, L. (2019). Developing plain language summaries of scientific congress abstracts – with patients, for patients: an expanded feasibility study. Current Medical Research and Opinion 35(Suppl 2):11-12. Doi: 10.1080/03007995.2019.1587943. Chari, D., Woolley, K., Arnstein, L., Gordon, M., Stones, S.R., Wadsworth, A.C., Schneider, R. & Montgomery, D.A. (2019). Developing plain language summaries of scientific congress abstracts – with patients, for patients: a feasibility study. Current Medical Research and Opinion 35(Suppl 2):34-35. Doi: 10.1080/03007995.2019.1583496. Sherratt, F.C., Bagley, H., Stones, S.R., Preston, J., Eaton, S., Allin, B.S.R., Walker, E., Hall, N.J. & Young, B. (2019). Improving core outcome set development for children and young people: Learning from a case study in acute appendicitis and consultation with an international group of children and young people. Journal of Evidence-based Medicine 12(Suppl 1):21. Doi: 10.1111/jebm.12335. Studenic P., Alunno A., Stones S.R., Ritschl V. & Nikiphorou E. (2018). Social Media Use for Health-Related Purposes By People with Rheumatic and Musculoskeletal Diseases – Results of a Global Survey. Arthritis & Rheumatology 70(Suppl 9). Available from: http://acrabstracts.org/abstract/social-media-use-for-health-related-purposes-by-people-with-rheumatic-and-musculoskeletal-diseases-results-of-a-global-survey/. Stones, S.R. on behalf of iSMART Research Group (2018). Supported self-management interventions for families and children aged 4 to 11 years old living with arthritis, asthma and type one diabetes: An integrative review. Annals of the Rheumatic Diseases 77(Suppl 2): 1797. Doi: 10.1136/annrheumdis-2018-eular.2994. Stones, S.R. on behalf of Young PARE Working Group (2018). A week to tweet: Findings from Young PARE’s online course for Twitter novices. Annals of the Rheumatic Diseases 77(Suppl 2): 55. Doi: 10.1136/annrheumdis-2018-eular.1948. Stones, S.R., Verstappen, S. & Cruickshank, S. (2017). The development and evaluation of an interactive health communication application to promote self-management in young people diagnosed with juvenile idiopathic arthritis: a pilot study. Rheumatology 56(Suppl 7): 050. Doi: 10.1093/rheumatology/kex390.050. Stones, S.R., Janson, D. & Wright, C. (2017). The essential role of consumers in clinical and health services research: best practice examples from the paediatric rheumatology clinical studies group consumer representatives. Rheumatology 56(Suppl 7): 068. Doi: 10.1093/rheumatology/kex390.068. Stones, S.R. & Wright, C. (2017). The critical role of patients, parents and carers in guiding the paediatric rheumatology research strategy for the United Kingdom through the clinical studies group. Research Involvement and Engagement 3(Suppl 1): P18. Doi: 10.1186/s40900-017-0075-x. Stones, S.R., Swallow, V., Milnes, L. & McGowan, L. (2017). Identifying the self-management needs of children with rheumatic and musculoskeletal diseases and their families: an exploratory sequential mixed methods study proposal. Rheumatology 56(Suppl 6): 049. Doi: 10.1093/rheumatology/kex356.033. Waite-Jones, J., Swallow, V., Smith, J., Stones, S.R., Majeed-Ariss, R. & Van Rooyen, V. (2017). Developing a mobile-app to aid young people’s self-management of chronic rheumatic disease: a qualitative study. Rheumatology 56(Suppl 6): 017. Doi: 10.1093/rheumatology/kex356.001. Stones, S.R. (2017). Developing, evaluation and implementing smartphone applications for young people living with rheumatic and musculoskeletal diseases: a scoping review of empirical research. Pediatric Rheumatology 15(Suppl 2): P268. Doi: 10.1186/s12969-017-0186-9. Ainsworth, S., Ainsworth, J., Preston, J., Stones, S.R., Challinor, R. & Rowe, M. (2017). Introducing RAiISE – Raising awareness of invisible illnesses in schools and education. Pediatric Rheumatology 15(Suppl 2): P113. Doi: 10.1186/s12969-017-0185-x. Sherratt, F.C., Roper, L., Baildam, E.M., Beresford, M.W., Stones, S.R., Ramanan, A., Foster, H., McErlane, F., Rooney, M., Peak, M. & Young, B. (2017). Families’ views on the feasibility of a corticosteroid trial in JIA: a qualitative study. Pediatric Rheumatology 15(Suppl 2): P248. Doi: 10.1186/s12969-017-0186-9. Stones, S.R. & Wright, C. on behalf of Lay/Consumer CSG Representatives. (2017). Involving patients, parents and carers in paediatric rheumatology research: best practice examples from lay representatives of the United Kingdom’s clinical studies group. Pediatric Rheumatology 15(Suppl 2): P109. Doi: 10.1186/s12969-017-0185-x. Stones, S.R., Cruickshank, S. & Verstappen, S.M.M. (2017). The development and evaluation of an interactive health communication application to educate and empower young people living with juvenile idiopathic arthritis: a pilot study. Annals of the Rheumatic Diseases 76(Suppl 2): 139. Doi: 10.1136/annrheumdis-2017-eular.1025. Stones, S.R., Bull, S.L. & Becerra, S. (2017). An exploration of lived experiences amongst adults with rheumatoid arthritis using an online research community platform: a pilot study. Annals of the Rheumatic Diseases 76(Suppl 2): 119. Doi: 10.1136/annrheumdis-2017-eular.1029. Cresswell, K., Parson, S., Stones, S.R., McDonagh, J.E., Thomson, W. & Lunt, L. (2017). Your Rheum – Giving young people a voice in rheumatology research. Annals of the Rheumatic Diseases 76(Suppl 2): 190. Doi: 10.1136/annrheumdis-2017-eular.5807. Andersen, J., Balazova, P., Boyd, P., Olsder, W., Ostuzzi, S., Papastavrou, T., Stones, S.R., Wilhelmer, T., Van Nieuwkoop, L., Caeyers, N. & Klett, F. (2017). Growing stronger together: implementing EULAR Young PARE’s strategy. Annals of the Rheumatic Diseases 76(Suppl 2): 1552. Doi: 10.1136/annrheumdis-2017-eular.4891. Andersen, J., Balazova, P., Olsder, W., Ostuzzi, S., Papastavrou, D., Stones, S.R., Wilhelmer, T. & Boyd, P. (2017). The importance of face-to-face networks: findings from the 2nd EULAR Young PARE conference, ‘Change the future’. Annals of the Rheumatic Diseases 76(Suppl 2): 1557. Doi: 10.1136/annrheumdis-2017-eular.3203. Sherratt, F., Roper, L., Baildam, E., Peak, M., McErlane, F., Stones, S.R. & Young, B. (2017). Family perspectives on the feasibility of a corticosteroid induction regimen randomised controlled trial in juvenile idiopathic arthritis: results of a qualitative study. Trials 18(Suppl 1): P384. Andersen, J., Stones, S.R., Balazova, P., Van Nieuwkoop, L., Papastavrou, T., Caeyers, N. & Klett, F. (2016). EULAR Young PARE: The voice of young people with rheumatic diseases across Europe. Annals of the Rheumatic Diseases 75(Suppl 2): 1325-1326. Doi: 10.1136/annrheumdis-2016-eular.4979. Stones, S.R. & MyJIA Expert Advisory Group. (2016). Juvenile idiopathic arthritis: it’s not just an old person’s disease. Annals of the Rheumatic Diseases 75(Suppl 2): 1324. Doi: 10.1136/annrheumdis-2016-eular.1160. Stones, S.R. (2016). How innovative technologies can support individuals to better self-manage their conditions. Annals of the Rheumatic Diseases 75(Suppl 2): 23. Doi: 10.1136/annrheumdis-2016-eular.1167. Majeed-Ariss, R., Fallon, D., Hall, A., McDonagh, J.E., Stones, S.R. & Swallow, V. (2015). Health theory in mobile technology apps supporting young people’s long-term condition/s management: a systematic review. European Health Psychologist 17(S): 682. Available from: http://www.ehps.net/ehp/index.php/contents/article/view/1162. Stones, S.R., Majeed, R., Hall, A. & Swallow, V. (2015). Involvement of children and young people with long-term conditions in the development of mobile app technology to promote disease self-management. Annals of the Rheumatic Diseases 74(Suppl 2): 163-164. Doi: 10.1136/annrheumdis-2015-eular.1450. Stones, S.R. & Wright, C. (2015). The top concerns of children and young people living with JIA. Annals of the Rheumatic Diseases 74(Suppl 2): 181. Doi: 10.1136/annrheumdis-2015-eular.1455. van de Louw, A., Kepic, M., Angevare, S., Ainsworth, S., Costello, W., Gruss, A. & Stones, S.R. (2019). Working For Better Care And Treatment Of Paediatric-Onset Rheumatic And Musculoskeletal Diseases: Introducing The European Network For Children With Arthritis. Poster presentation at: 2019 CARRA Annual Scientific Meeting, 10-14 April 2019, Louisville, Kentucky, United States of America. Doi: 10.13140/RG.2.2.30931.63524. Kepic, M. & Stones, S.R., on behalf of the WORD Day Committee. (2019). World Young Rheumatic Diseases Day (WORD Day): Spreading the word that children and young people get rheumatic diseases too. Poster presentation at: 22nd EULAR Annual European Conference of PARE, 04 April 2019, Prague, Czech Republic. Doi: 10.13140/RG.2.2.24482.89289. Makri, S. & Stones, S.R., on behalf of the European Network of Fibromyalgia Associations (ENFA). (2019). ‘You can live well’ – Tips and tricks for managing fibromyalgia. Poster presentation at: 22nd EULAR Annual European Conference of PARE, 04 April 2019, Prague, Czech Republic. Doi: 10.13140/RG.2.2.11061.12004. Stones, S.R., Ainsworth, S., Ainsworth, J.S., Preston, J., Challinor, R. & Rowe, M. (2019). Identifying items for consideration under the remit of the National Institute for Health and Care Excellence (NICE) guideline on social and emotional wellbeing in primary and secondary education. Online poster presentation at: NICE Guideline Stakeholder Workshop for Social and Emotional Wellbeing in Primary and Secondary Education, 26 March 2019, London, England, United Kingdom. Doi: 10.13140/RG.2.2.21966.31044. Ainsworth, S., Preston, J. & Stones, S.R. (2019). Enabling children, young people and families to get involved in research: A case study from GenerationR Liverpool’s Parent and Carer Research Forum. Poster presentation at: 2nd Great North Children’s Research Community Conference, 08 March 2019, Newcastle, England, United Kingdom. Doi: 10.13140/RG.2.2.26264.65285. Studenic, P., Stones, S.R., Alunno, A., Ritschl, V. & Nikiphorou, E. (2018). Social Media Use for Health-Related Purposes By People with Rheumatic Diseases. Poster presentation at: Annual Meeting of the Austrian Society for Rheumatology and Rehabilitation (Österreichische Gesellschaft für Rheumatologie & Rehabilitation), 29 November-01 December 2018, Vienna, Austria. Sherratt, F.C., Eaton, S., Allin, B.S., Bagley, H., Stones, S.R., Preston, J., Walker, E., Young, B. & Hall, N. (2018). Improving core outcome set development for children and young people (CYP): Learning from a case study in acute appendicitis and consultation with an international group of CYP. Poster presentation at: 7th COMET Initiative Meeting, 15-16 November 2018, Amsterdam, Netherlands. Ainsworth, J.S., Ainsworth, S., Challinor, R., Rowe, M., Preston, J. & Stones, S.R. (2018). Things get solved when you become involved: A case study of RAiISE, a young person and family-led research initiative to improve education support for young people with chronic conditions. Poster presentation at: 14th Annual UK Clinical Research Facilities Network Conference, 12-13 July 2018, Leeds, England, United Kingdom. Doi: 10.13140/RG.2.2.28269.69608. Stones, S.R. (2017). Self- and shared-management interventions for children of primary school age (4 to 11 years old) with chronic conditions and their families: a review of the literature. Poster presentation at: University of Leeds School of Healthcare Postgraduate Research Conference, 01 November 2017, Leeds, England, United Kingdom. Doi: 10.13140/RG.2.2.11792.92168. Stones, S.R.,Ainsworth, S., Ainsworth, S., Challinor, R., Gamble, C., McGowan, L., Milnes, L., Preston, J. & Swallow, V. (2017).Self-management of chronic disease in childhood: the iSMART study. Poster presentation at: 3rd iCAN Research and Advocacy Summit, 10-14 July 2017, Orlando, Florida, United States of America. Doi: 10.13140/RG.2.2.32862.33603. Preston, J., Ainsworth, S., Challinor, R. & Stones, S.R. (2017). RAiISE: Raising awareness of invisible illnesses in schools and education. Poster presentation at: 3rd iCAN Research and Advocacy Summit, 10-14 July 2017, Orlando, Florida, United States of America. Doi: 10.13140/RG.2.2.11713.04964. Ainsworth, S., Preston, J., Challinor, R. & Stones, S.R. (2017). GenerationR: Young people improving research across England. Poster presentation at: 3rd iCAN Research and Advocacy Summit, 10-14 July 2017, Orlando, Florida, United States of America. Doi: 10.13140/RG.2.2.28563.17446. Preston, J., Dicks, P., Gaillard, S., Nafría, B., Ainsworth, S., Challinor, R., Main, S. & Stones, S.R. (2017). Empowering young people and families to contribute to paediatric clinical research via the European YPAG network (eYPAGnet). Poster presentation at: 3rd iCAN Research and Advocacy Summit, 10-14 July 2017, Orlando, Florida, United States of America. Doi: 10.13140/RG.2.2.34435.20005. Sheridan, R., Martin-Kerry, J., Preston, J., Stones, S.R., Challinor, R. & Knapp, P. on behalf of the TRECA Study Advisory Group and the TRECA Study Patient and Parent Advisory Group. (2017). Changing the way children, adolescents and their families are informed about clinical research through novel multimedia information resources. Poster presentation at: 13th Annual UK Clinical Research Facilities Network Conference, 06-07 July 2017, Glasgow, Scotland, United Kingdom. Stones, S.R., Majeed-Ariss, R. & Swallow, V. (2014). Developing mobile applications for and with young people with long-term conditions learning to share their healthcare with professionals: a young person and family-led approach. Poster presentation at: NIHR INVOLVE Conference, 26-27 November 2014, Birmingham, England, United Kingdom. Doi: 10.13140/RG.2.1.2761.4566. Stones, S.R. (2019). Seven years to transform. Oral presentation at: NIHR INVOLVE Diversity and Inclusion Working Group Meeting, 02 April 2019, London, England, United Kingdom. Available from: http://www.slideshare.net/SimonStones/seven-years-to-transform. Stones, S.R. (2019). Sesquipedalians versus Hippopotomonstrosesquipedaliophobes: It’s time to make research accessible for all. Oral presentation at: 8th European Meeting of ISMPP, 23 January 2019, London, England, United Kingdom. Available from: http://www.slideshare.net/SimonStones/sesquipedalians-versus-hippopotomonstrosesquipedaliophobes-its-time-to-make-research-accessible-for-all. Stones, S.R. (2018). Nothing about me, without me: Driving innovation with the patient community. Oral presentation at: Actelion Global Scientific Information (GSI) Lunch Talk, 06 December 2018, Basel, Switzerland. Stones, S.R. (2018). Digging for nuggets of gold: Developing a self-and shared-management framework to support children with arthritis and their families using a realist approach. Oral presentation at: University of Leeds School of Healthcare Postgraduate Research Conference, 06 November 2018, Leeds, England, United Kingdom. Available from: http://doi.org/10.13140/RG.2.2.12424.06403. Stones, S.R. (2018). Patient and public involvement in research: Two sides of the same coin. Oral presentation at: University College Dublin’s Facilitating a collaborative approach to arthritis and rheumatic disease research conference, 02 November 2018, Dublin, Ireland. Available from: http://www.slideshare.net/SimonStones/patient-and-public-involvement-in-research-two-sides-of-the-same-coin. Wright, C., Stones, S.R., Parker, D. & Vale, S. (2018). Making research opportunities visible to young people with JIA and their families. Oral presentation at: British Society for Paediatric and Adolescent Rheumatology Conference, JIA Topic Specific Group Meeting, 18 October 2018, Southampton, England, United Kingdom. Available from: http://doi.org/10.13140/RG.2.2.26355.37924. Stones, S.R. (2018). JIA journeys. Oral presentation at: Children’s Chronic Arthritis Association (CCAA) Family Support Weekend, 29 September 2018, Castleton, England, United Kingdom. Available from: http://www.slideshare.net/SimonStones/jia-journeys. Nightingale, R. & Stones, S.R. (2018). Getting to grips with involving and engaging children, young people and families in research. Oral presentation at: Leeds Children’s Hospital Research Forum, 23 August 2018, Leeds, England, United Kingdom. Available from: http://www.slideshare.net/SimonStones/getting-to-grips-with-involving-and-engaging-children-young-people-and-families-in-research. Stones, S.R. (2018). Why fit in when you were born to stand out! Oral presentation at: 4th iCAN Research and Advocacy Summit, 09 July 2018, Edinburgh, Scotland, United Kingdom. Available from: http://www.slideshare.net/SimonStones/why-fit-in-when-you-were-born-to-stand-out-106041227. Stones, S.R. (2018). It’s more than just aches and pains. Oral presentation at: NRAS Bolton Rheumatoid Arthritis Support Group Meeting, 05 June 2018, Bolton, England, United Kingdom. Available from: http://www.slideshare.net/SimonStones/its-more-than-just-aches-and-pains. Stones, S.R. (2018). Stumbling through the fog: A lived experience of fibromyalgia. Oral presentation at: ME, CFS and Fibromyalgia Alliance Malta VO/818 and European Network of Fibromyalgia Associations (ENFA) Conference, 12 May 2018, Attard, Malta. Available from: http://www.slideshare.net/SimonStones/stumbling-through-the-fog-a-lived-experience-of-fibromyalgia. Stones, S.R. (2018). In the driving seat: Health care and research led for, and by young people. Oral presentation at: University of Central Lancashire (UCLAN) Centre for Children and Young People’s Participation Seminar Series, 21 March 2018, Preston, England, United Kingdom. Available from: http://www.slideshare.net/SimonStones/in-the-driving-seat-health-care-and-research-led-for-and-by-young-people. Stones, S.R. (2018). 8766 days to change a life. Oral presentation at: The Hospital for Sick Children (SickKids) Child Health Evaluative Sciences (CHES) Research Group Seminar, 05 March 2018, Toronto, Ontario, Canada. Available from: http://www.slideshare.net/SimonStones/8766-days-to-change-a-life/SimonStones/8766-days-to-change-a-life. Stones, S.R. (2018). Tell me and I forget, teach me and I remember, involve me and I learn. Oral presentation at: Glasgow Caledonian University School of Health and Life Sciences Research Seminar, 07 February 2018, Glasgow, Scotland, United Kingdom. Available from: http://www.slideshare.net/SimonStones/tell-me-and-i-forget-teach-me-and-i-remember-involve-me-and-i-learn. Stones, S.R. (2017). Your voice, your story, your life: You matter. Oral presentation at: NIHR Manchester Clinical Research Facility Young Person’s Advisory Group Inaugural Meeting, 02 December 2017, Manchester, England, United Kingdom. Available from: http://www.slideshare.net/SimonStones/your-voice-your-story-your-life-you-matter. Stones, S.R. (2017). Social media and the path to health empowerment. Oral presentation at: 6th Children’s Research Network for Ireland and Northern Ireland Conference, 29 November 2017, Dublin, Ireland. Available from: http://www.slideshare.net/SimonStones/social-media-in-research-83139922. Stones, S.R. (2017). Breaking barriers, embracing expertise: When patients become people in research. Oral presentation at: 6th Children’s Research Network for Ireland and Northern Ireland Conference, 29 November 2017, Dublin, Ireland. Available from: http://www.slideshare.net/SimonStones/breaking-barriers-embracing-expertise-when-patients-become-people-in-research. Stones, S.R. (2017). Research – The best treatment I’ve ever had. Oral presentation at: INVOLVE at 21 Conference, 28 November 2017, London, England, United Kingdom. Available from: http://www.slideshare.net/SimonStones/research-the-best-treatment-ive-ever-had. Stones, S.R. (2017). Paving the way for a brighter future: Opportunities to involve young people in healthcare research across Greater Manchester. Oral presentation at: The University of Manchester’s Child Health Research Network’s Workshop on Greater Manchester Devolution, 20 November 2017, Manchester, England, United Kingdom. Available from: http://www.slideshare.net/SimonStones/paving-the-way-for-a-brighter-future-opportunities-to-involve-young-people-in-healthcare-research-across-greater-manchester. Preston, J. & Stones, S.R. (2017). Ensuring research really does involve the young person. Oral presentation at: The Health Research Authority (HRA) Course on the Ethical Issues of Research Involving Children, 08 November 2017, Manchester, England, United Kingdom. Available from: http://www.slideshare.net/SimonStones/ensuring-research-really-does-involve-the-young-person. Stones, S.R. (2017). Co-design, Co-produce, Co-deliver: Collaboration is the only viable path to success. Oral presentation at: Translate External Advisory Board Meeting, 06 November 2017, Leeds, England, Untied Kingdom. Available from: http://www.slideshare.net/SimonStones/codesign-coproduce-codeliver-collaboration-is-the-only-viable-path-to-success. Swallow, V. & Stones, S.R. (2017). Co-creating customised and reliable, home-based digital condition-management apps: a qualitative study involving children with long-term conditions. Oral presentation at: Patient Information Forum Conference, Health Information for Children and Young People, 03 November 2017, London, England, United Kingdom. Chadwick, C. & Stones, S.R. (2017). Introducing Consulting at McCann Health. Oral presentation at: University of Leeds, Faculty of Biological Sciences Placement Day, 21 September 2017, Leeds, England, United Kingdom. Stones, S.R. (2017). Pain is real, but so is hope. Oral presentation at: 16th European Network for Arthritis in Children (ENCA) Conference, 16 September 2017, Athens, Greece. Stones, S.R. (2017). What is really bothering my patient? Oral presentation at: 24th European Paediatric Rheumatology Congress, 15 September 2017, Athens, Greece. Available from: 10.13140/RG.2.2.35122.50882. Stones, S.R. (2017). Social media and the path to empowerment: We’ve got the power! Oral presentation at: Carion Fenn Foundation Support Group Meeting, 10 August 2017, Ajax, Ontario, Canada. Available from: http://www.slideshare.net/SimonStones/social-media-and-the-path-to-empowerment-weve-got-the-power. Stones, S.R. (2017). When personal and professional experiences intersect: the path to success. Oral presentation at: 1st European Patients’ Forum Summer Training Course for Young Patient Advocates, 05 July 2017, Vienna, Austria. Available from: http://www.slideshare.net/SimonStones/when-personal-and-professional-experiences-intersect-the-path-to-success. Stones, S.R. (2017). Self management of fibromyalgia from a patient perspective. Oral presentation at: 18th EULAR Annual Congress of Rheumatology, 17 June 2017, Madrid, Spain. Doi: 10.13140/RG.2.2.23365.86247. Stones, S.R. (2017). The patient will see you now: a new era of empowered people living with health conditions. Oral presentation at: Library and Information Health Network North West (LIHNN) / NW Health Care Libraries Unit (HCLU) Briefing, 13 June 2017, Haydock, England, United Kingdom. Doi: 10.13140/RG.2.2.29237.88809. van’t Hoff, W. & Stones, S.R. (2017). Patients as partners – transforming the delivery of clinical research in the NHS. Oral presentation at: 2nd Clinical Innovation and Partnering World 2017, 08 March 2017, London, England, United Kingdom. Stones, S.R. (2017). Shared experience of sitting on a clinical studies group (CSG) as a patient advocate. Oral presentation at: Diabetes UK Clinical Studies Groups Lay and Health Care Professional Member Induction, 27 February 2017, London, England, United Kingdom. Doi: 10.13140/RG.2.2.30340.94085. Stones, S.R., Nikiphorou, E. & Unesi, N. (2017). The social media revolution: strategies to create and strengthen communication in a digital era. Oral presentation at: 20th EULAR Annual European Conference of PARE, 24-25 February 2017, Cascais, Portugal. Doi: 10.13140/RG.2.2.28663.21927. Stones, S.R. & Wright, C. (2017). The development of a toolkit for patient, parent and carer representatives involved in shaping clinical and health services research. Oral presentation at: 20th EULAR Annual European Conference of PARE, 24 February 2017, Cascais, Portugal. Doi: 10.13140/RG.2.2.12410.29124. Stones, S.R. (2016). Using social media to deliver effective and engaging interactions. Oral presentation at: 2nd EULAR Young PARE Conference, 22 October 2016, Retie, Belgium. Doi: 10.13140/RG.2.2.27969.15205. Stones, S.R. (2016). Patient and public involvement in research – views of young people. Oral presentation at: 8th Conference of the European Paediatric Formulation Initiative, 21 September 2016, Lisbon, Portugal. Doi: 10.13140/RG.2.2.32374.80964. Stones, S.R. (2016). Shared experience of consumer involvement on a clinical studies group. Oral presentation at: Diabetes UK Clinical Studies Group Inaugural Chairs’ Forum, 08 September 2016, London, England, United Kingdom. Doi: 10.13140/RG.2.2.22827.03363. Preston, J., Stones, S.R., Barker, L. & George, E. (2016). Exciting things happen when involving young people to promote better research for better healthcare. Oral presentation at: 2nd Annual DPharm Europe Conference, 09 February 2016, London, England, United Kingdom. Doi: 10.13140/RG.2.2.20197.40166. Swallow, V. & Stones, S.R. (2015). Health professionals and patients as co- researchers: dream or reality? Oral presentation at: 1st Leeds Children’s Hospital Conference, 16 October 2016, Leeds, England, United Kingdom. Doi: 10.13140/RG.2.2.23552.84485. Majeed-Ariss, R., Fallon, D., Swallow, V., Hall, A., McDonagh, J.E. & Stones, S.R. (2015). Health theory in mobile technology apps supporting young people’s long-term condition/s management: a systematic review. Oral presentation at: 29th Conference of the European Society of Health Psychology, 01 September 2015, Limassol, Cyprus. Available from: http://www.researchgate.net/publication/283088080_Health_theory_in_mobile_technology_apps_supporting_young_people%27s_long-term_conditions_management_a_systematic_review. Swallow, V., Stones, S.R. & Majeed-Ariss, R. (2015). Nurses and patients as co-researchers: dream or reality? Oral presentation at: 2nd Biennial Nursing Scholarship Conference of Sigma Theta Tau International: Phi Mu Chapter, 19 June 2015, Leeds, England, United Kingdom. Available from: http://www.researchgate.net/publication/283088266_Nurses_and_patients_as_co-researchers_dream_or_reality. Bijlsma, J.W.J., Caeyers, N., de Wit, M.P.T., Goyens, C., Kouloumas, M., Stamm, T., Stones, S.R., Wiek, D. & EULAR. (2018). 21st EULAR Annual European Conference of PARE report. Report produced by: EULAR Standing Committee of PARE. Bijlsma, J.W.J., Caeyers, N., de Wit, M.P.T., Goyens, C., Kouloumas, M., Mateus, E., Opava, C., Stones, S.R., Wiek, D. & EULAR. (2017). 20th EULAR Annual European Conference of PARE report. Report produced by: EULAR Standing Committee of PARE. Doi: 10.13140/RG.2.2.31549.67047. Stones, S.R., Douglas, S., Janson, D. & Wright, C. (2017). Clinical studies group: a toolkit for patient, parent and carer representatives. Toolkit produced by: NIHR CRN: Children/Arthritis Research UK Paediatric Rheumatology CSG Consumer TSG. Doi: 10.13140/RG.2.2.19030.45121. Andersen, J., Balazova, P., Caeyers, N., Klett, F., Olsder, W., Papastavrou, T., Stones, S.R., van Nieuwkoop, L. & EULAR Young PARE. (2016). 2nd EULAR Young PARE Conference, ‘Change the Future’ report. Report produced by: EULAR Young PARE. Doi: 10.13140/RG.2.2.10848.28168. Bijlsma, J.W.J., Boteva, B., Bozhinova, S., de Wit, M.P.T., Kouloumas, M., Mateus, E., Opava, C., Stones, S.R., Wiek, D. & EULAR. (2016). 19th EULAR Annual European Conference of PARE report. Report produced by: EULAR Standing Committee of PARE. Doi: 10.13140/RG.2.2.27625.49768. Swallow, V., Baildam, E., Chieng, A., Douglas, S., Foster, H., Hall, A., McDonagh, J., Stones, S.R., Thomson, W. & Wyllie, R. (2015). Fostering a Manchester-based, interdisciplinary research programme on mobile technologies for young people with long-term conditions to promote optimum disease management. Report submitted for: The University of Manchester Research Institute Pump Priming Programme. Beresford, M.W., Baildam, E., Ramanan, A.V., Douglas, S., Clinch, J., Bishop, N., Rooney, M., Thomson, W., Stones, S.R., Sen, E., Pain, C., Armon, K., Haggart, E., Batchelor, H., Wright, C., Janson, D., Ioannou, J., Hawley, D., Nistala, K., McDonagh, J., Eleftheriou, D., Smith, E. & Duong, C. (2015). NIHR CRN: Children/Arthritis Research UK paediatric rheumatology clinical studies group clinical research strategy. Strategy document produced by: NIHR CRN: Children/Arthritis Research UK Paediatric Rheumatology CSG. Available from: http://www.arthritisresearchuk.org/~/media/Files/Research/Paediatric%20Rheumatology/Paed%20Rheum%20CSG%20Strategy%202015.ashx?la=en. Beresford, M.W., Baildam, E., Ramanan, A.V., Douglas, S., Clinch, J., Bishop, N., Rooney, M., Thomson, W., Stones, S.R., Sen, E., Pain, C., Armon, K., Haggart, E., Batchelor, H., Wright, C., Janson, D., Ioannou, J., Hawley, D., Nistala, K., McDonagh, J., Eleftheriou, D., Smith, E., Duong, C., Wedderburn, L.R., Brogan, P. & Al-Ashimi, A. (2015). Paediatric rheumatology CSG progress report 1st April 2014 – 31st March 2015. Report produced by: NIHR CRN: Children/Arthritis Research UK Paediatric Rheumatology CSG. Available from: http://www.arthritisresearchuk.org/~/media/Files/Research/Paediatric%20Rheumatology/Annual%20Reports/PR%20CSG%20Report%202015.ashx?la=en. Stones, S.R. (2018). Ako zijem svoj zivot naplno. Bedeker Zdravia. November-December 2018. Stones, S.R. (2018). Be open to change – not everything is set in stone. The University of Manchester Faculty of Biology, Medicine and Health. Available from: http://manchesterbmhstudents.wordpress.com/2018/09/14/be-open-to-change-not-everything-is-set-in-stone/. Stones, S.R. (2018). RAiISE-ing Our Voice – Simon. RAiISE. Available from: http://raiise.co.uk/2018/09/05/raiise-ing-our-voice-simon/. Stones, S.R. (2018). You can talk the talk, but can you walk the walk? Endeavouring to influence policy and practice as a patient researcher. European Patient Ambassador Programme/European Lung Foundation. Available from: http://www.epaponline.org/news/latest/can-you-walk. Alunno, A., Nikiphorou, E., Olsder, W. & Stones, S.R. (2018). Young PARE and EMEUNET – collaborating closely. Breakthrough 13/2018: 10. Available from: http://www.eular.org/myUploadData/files/eular_breakthrough_newsletter_issue_13_online_version.pdf. Stones, S.R. (2018). Introducing Young PARE. EULAR HPR News 3/2018: 12. Available from: http://www.eular.org/myUploadData/files/hpr_news_2018_1_final_web.pdf. Stones, S.R. (2018). Patient peer review for the Research Involvement and Engagement journal. BMC On Medicine. Available from: http://blogs.biomedcentral.com/on-medicine/2018/02/05/patient-peer-review-for-the-research-involvement-and-engagement-journal/. Stones, S.R. (2017). Simon R. Stones. UK Blog Awards. Stones, S.R. (2017). Simon Stones: Patient Research Ambassador case study. National Institute for Health Research. Available from: http://www.nihr.ac.uk/patients-and-public/how-to-join-in/patient-research-ambassadors/ambassador-stories/case-study-simon-stones.htm. Stones, S.R. (2017). Healthcare 2.0: Social media in healthcare. BMJ Evidence-based Nursing Blog. Available from: http://blogs.bmj.com/ebn/2017/07/16/health-2-0-social-media-in-healthcare/. Stones, S.R. (2017). Fica rme, orgulhoso e lembra-te, tu nunca estás sozinho! / Stand tall, stand proud and remember, you are never alone! Associação Nacional dos Doentes com Artrites Infantis. Available from: http://www.andai.org.pt/images/publicações/boletim25__-1a_Parte.pdf. Stones, S.R. (2017). You’ve never looked better! Arthur’s Place. Available from: http://arthursplace.co.uk/blog-post/youve-never-looked-better/. Stones, S.R. (2017). #MyIBDStory – Simon Stones. The Toilet Me and IBD. Available from: http://www.facebook.com/TMIBD/posts/1800938190223672. Stones, S.R. (2017). Simon’s story. Cloudy with a chance of pain. Available from: http://cloudywithachanceofpain.com/blog/simon-s-story. Stones, S.R. & Fibromyalgia Action UK. (2017). Cloudy guest blog: Fibromyalgia Action UK. Cloudy with a chance of pain. Available from: http://cloudywithachanceofpain.com/blog/guest-blog-fibromyalgia-uk. Stones, S.R. (2017). Man up: young men get arthritis too. Arthur’s Place. Available from: http://arthursplace.co.uk/blog-post/man-young-men-get-arthritis/. Stones, S.R. (2017). The future is ours. iCAN Research. Stones, S.R. (2017). Simon says… Arthur’s Place. Available from: http://arthursplace.co.uk/blog-post/simon-says/. Stones, S.R. (2017). Stepping stones. The Researcher 3: 4-5. Available from: http://www.cocreatedesign.com/clientarea/NHS/TheResearcherMagazine_Issue3/#p=4. Balazova, P., van Nieuwkoop, L. & Stones, S.R. (2017). Young PARE “Change the Future” conference. EULAR e-Breakthrough 14: 4. Available from: http://www.eular.org/sysModules/sysFiles/ckeditor_4/plugins/doksoft_uploader/userfiles/eBreakthrough%20January%202017%20FINAL.pdf. Stones, S.R. (2016). Talk about your arthritis. Flexiseq®. Stones, S.R. (2016). Family-focused care across the life course. International Family Nursing Association. Available from: http://internationalfamilynursing.org/2016/12/18/family-focused-care-across-the-life-course/. Preston, J., Steel, R., Inns, K., Stones, S.R. & Wilson, K. (2016). Patients promoting and raising awareness of health research. Consumers Health Forum of Australia.Available from: http://chf.org.au/blog/patients-promoting-and-raising-awareness-health-research. Stones, S.R. (2016). Zivot s reumatickym ochorenim: „Ako zijem svoj zivot naplno“. Nálezy a straty s reumou 50-53.Available from: https://simonstones.files.wordpress.com/nalezy-a-straty-s-reumou_2016. Stones, S.R. (2016). Technology to help your arthritis. Flexiseq®. Stones, S.R. (2016). Come godersi la vita sino in fondo: la storia di Simon. Morfologie 22: 16-19. Available from: http://www.apmar.it/documenti/notizie/Morfologie/morfologie_22-2016_-_APMAR_Onlus.pdf. Stones, S.R. (2016). Making research everyone’s business. Patient Research Exchange. Available from: http://www.patientresearchexchange.org/stories/detail/making-research-everyones-business. Stones, S.R. (2016). Simon Stones – Top tips for studying with arthritis. Flexiseq®. Available from: http://flexiseq.com/blogs/news/simon-stones-top-tips-for-studying-with-arthritis. Stones, S.R. (2016). Meet Simon and EULAR. PsAZZ News 16: 6-9. Stones, S.R. (2016). Das leben voll auskosten. Mobil Deutsche Rheuma-Liga 20-21. Stones, S.R. (2016). Collaboration is the key to success. EULAR e-Breakthrough Special Issue July 2016: 4. Available from: http://www.eular.org/myUploadData/files/e-Breakthrough%20Special%20Issue%20London%20Congress%20July%202016%20FINAL.pdf. Stones, S.R. (2016). A life without arthritis wouldn’t be my life; Living with a rheumatic or musculoskeletal disease – How I take action to enjoy life to the full. EULAR Edgar Stene Prize 2016 7-8. Available from: http://www.eular.org/myUploadData/files/EULAR_Stene_Prize_Book_ONLI NE_Version_2016_06-06-16.pdf. Stones, S.R. (2016). Trust me, better days will come. Arthur’s Place. Available from: http://arthursplace.co.uk/life/real-life- stories/2016/05/09/trust-better-days-will-come/. Stones, S.R. (2016). Arthritis is for old people, right? The Huffington Post. Available from: http://www.huffingtonpost.co.uk/simon-stones-/arthritis-is- for-old-people-right_b_9784016.html?utm_hp_ref=uk-health. Stones, S.R. (2016). Inspiring story: living with fibromyalgia and arthritis from the age of three. Fibromyalgia Action UK. Available from: http://www.fmauk.org/latest-news-mainmenu-2/articles-1/1055-inspiring-story-living-with-fibromyalgia-and-arthritis-from-the-age-of-three. Stones, S.R. (2016). So many things; so little time! Transition Information Network My Future Choices 28: 20-21. Available from: http://councilfordisabledchildren.org.uk/sites/default/files/uploads/docu ments/Issue28_Feb2016.pdf. Preston, J., Stones, S.R., George, E., Barker, L. & Flewitt, J. (2016). Exciting things happen when involving young people to promote better research for better healthcare. GenerationR. Available from: http://generationr.org.uk/exciting-things-happen-when-involving-young- people-to-promote-better-research-for-better-healthcare/. Stones, S.R. (2016). Top tips for living with IBD at university. IBD Relief. Available from: http://www.ibdrelief.com/learn/living-with-ibd/young- people/university/university-top-tips. Stones, S.R. (2016). Living with IBD at university. IBD Relief. Available from: http://www.ibdrelief.com/learn/living-with-ibd/young- people/university/living-with-ibd-at-university. Stones, S.R. (2016). Simon Stones – My IBD story. IBD Relief. Available from: http://www.ibdrelief.com/ibd-stories/simon-stones. Stones, S.R. (2015). Patients in research: delivering person-centric care. Students 4 Best Evidence. Available from: http://www.students4bestevidence.net/patients-research-delivering- person-centric-care/. Stones, S.R. (2015). Having arthritis since the age of three has led me to a research career. Arthritis Research UK. Available from: http://www.arthritisresearchuk.org/arthritis-information/your- stories/juvenile-idiopathic-arthritis/simon-stones.aspx. Stones, S.R. (2014). 1962 – The first total hip replacement. Bollington Festival Scarecrow Science Festival: 50 years of biomedical discovery. Stones, S.R. (2014). Autoimmune disease series: IBD – hate your guts? Oxbridge Biotech Roundtable. Stones, S.R. (2013). Autoimmune disease series: Arthritis – fact or fiction? Oxbridge Biotech Roundtable. Stones, S.R. (2018). What Is New – Paediatric Rheumatological Conditions (April 2018 to September 2018). EMEUNET. Available from: http://emeunet.eular.org/win_paediatric_rheumatology.cfm. Stones, S.R. (2018). Simon R. Stones. Chronic Illness Bloggers Network. Available from: http://chronicillnessbloggers.com/bloggerdirectory/3005/simon-r-stones/. Stones, S.R. (2017). Left to cope in the dark: The realities of being young with arthritis. Digital image at: 8th University of Leeds Doctoral College Showcase. Available from: https://simonstones.files.wordpress.com/2018/01/stones-2017-left-to-cope-in-the-dark.pdf. Stones, S.R. (2017). Seeing the GP: Advice and tips for young people. Digital media for: Healthtalk.org. Available from: http://www.healthtalk.org/young-peoples-experiences/seeing-gp-advice-and-tips-young-people/simon. Stones, S.R. (2016). A heavy weight for small hands. Digital image at: 7th Annual University of Leeds Postgraduate Research Conference. Available from: https://simonstones.files.wordpress.com/2016/12/a-heavy-weight-for-small-hands.jpeg. Elliott, J., Lodemore, M., Minogue, V. & Wellings, A. (2019). Public Co-Applicants in Research – guidance on roles and responsibilities. Southampton: INVOLVE. Available from: http://www.invo.org.uk/posttypepublication/public-co-applicants-in-research-guidance-on-roles-and-responsibilities/. Waite-Jones, J.M. & Swallow, V. (2018). Peer-based social support for young-people with Juvenile Arthritis: views of young people, parents/carers and healthcare professionals within the UK. Journal of Pediatric Nursing 43: e85-e91. Doi: 10.1016/j.pedn.2018.07.012. Salunke, S. & Tuleu, C. (2018). Formulating better medicines for children – Collaborate to innovate. International Journal of Pharmaceutics 536(2): 487-489. Doi: 10.1016/j.ijpharm.2017.08.009. Deepak, S., Baildam, E., McErlane, F. and HTA 14/167/01 SIRJIA Trial Management Group. (2017). Outcome measures used in JIA trials – a literature review as part of the SIRJIA Study. Pediatric Rheumatology 15(Suppl 2): P230. Doi: 10.1186/s12969-017-0186-9. Healthtalk.org. (2017). Seeing the GP: Advice and tips for young people. Healthtalk.org. Available from: http://www.healthtalk.org/young-peoples-experiences/seeing-gp-advice-and-tips-young-people/credits. Arthritis Research UK. (2017). Musculoskeletal conditions and multimorbidity. Arthritis Research UK. Available from: http://www.versusarthritis.org/media/2078/msk-conditions-and-multimorbidity-report.pdf. Swallow, V., Tod, A. & Smith, J. (2017). Fostering and sustaining UK, multidisciplinary, family- focused care across the life-course: A White Rose collaboration in long-term condition management. White Rose University Consortium. Available from: http://www.whiterose.ac.uk/wp-content/uploads/2016/01/FAMILY-FOCUSED-CARE-Workshop-Report.pdf. Balazova, P.(2016). The role of Young PARE in getting organised: The virtual knowledge centre. Annals of the Rheumatic Diseases 75 (Suppl 2): 18. Doi: 10.1136/annrheumdis-2016-eular.6371. Majeed-Ariss, R., Hall, A.G., McDonagh, J., Fallon, D. & Swallow, V. (2015). Mobile phone and tablet apps to support young people’s management of their physical long-term conditions: a systematic review protocol. JMIR Research Protocols 4(2): e40. Doi: 10.2196/resprot.4159. McErlane, F., Armitt, G., Douglas, S., HQIP JIA Audit Expert Group, BSPAR Parent Group, CHART Consortium, CAPTURE-JIA Steering Group, Pilkington, C., Thomson, W., Bailey, K. & Cleary, G. (2015). Development of a national clinical audit tool for children and young people with juvenile idiopathic arthritis (JIA) – a BSPAR project funded by the Healthcare Quality Improvement Partnership (HQIP). Poster presentation at: BSPAR Conference, 24-25 September 2015, Belfast, United Kingdom. Available from: http://www.researchgate.net/publication/282947623_Development_of_a_national_clinical_audit_tool_for_children_and_young_people_with_juvenile_idiopathic_arthritis_JIA_-_a_BSPAR_project_funded_by_the_Healthcare_Quality_Improvement_Partnership_HQIP. Learning For Involvement. (2019). Training Providers. NIHR INVOLVE. Available from: http://learningforinvolvement.org.uk/training-providers/. Flexiseq. (2019). 7 Arthritis Blogs We Can’t Stop Reading. Flexiseq. Available from: http://flexiseq.com/blogs/news/7-arthritis-blogs-we-can-t-stop-reading. ISMPP. (2019). 2019 European Meeting of ISMPP: Attendees Now Fit for the Future. Available from: http://ismpp-newsletter.com/2019/02/22/2019-european-meeting-of-ismpp-attendees-now-fit-for-the-future/. The Publication Plan. (2019). Meeting report: summary of day 2 of the 2019 European ISMPP Meeting. The Publication Plan. Available from: http://thepublicationplan.com/2019/02/07/meeting-report-summary-of-day-2-of-the-2019-european-ismpp-meeting/. Thompson, K. & Dalton, S. (2018). Using social media to promote your research. University of Leeds. Available from: http://www.slideshare.net/KirstenThompson2/social-media-for-researchers-openresleeds2018. EULAR. (2018). ‘Don’t Delay, Connect Today’ educates on the importance of early diagnosis of rheumatic and musculoskeletal diseases. Open Access Government. Available from: http://www.openaccessgovernment.org/rheumatic-and-musculoskeletal-diseases/53224/. International Children’s Advisory Network (iCAN). (2018). What is iCAN research? iCAN. Available from: http://www.youtube.com/watch?v=Wwn35_hGM6A. International Children’s Advisory Network (iCAN). (2018). November spotlight awareness: Diabetes. iCAN. Available from: http://www.youtube.com/watch?v=zCOpnRM8NaY. Olsen, J. (2018). Fibromyalgien er global. Medlemsbladet – fibromyalgi. Available from: http://www.fibromyalgi.dk/til-medlemmer/medlemsblad/nr-4-2018/. Prakken, B. (2018). Paediatric Rheumatology European Society (PReS). EULAR e-Breakthrough 19: 3. Available from: http://www.eular.org/myUploadData/files/ebreakthrough_october_2018_final.pdf. Children’s Parliament. (2018). Unfearties – Simon Stones. Children’s Parliament. Available from: http://www.childrensparliament.org.uk/about-us/unfearties/simon-stones/. BMC. (2018). Author Profile – Simon R. Stones. BMC. Available from: http://blogs.biomedcentral.com/blog/author/simonstones/. EMEUNET. (2018). EMEUNEWS Special Edition: Meet the EMEUNET Working Group 2018-2019. Emerging EULAR Network. Available from: http://emeunet.eular.org/myUploadData/files/working_group_newsletter_2018_19_final.pdf. iCAN. (2018). iCAN Quarterly Newsletter Summit Recap Edition. International Children’s Advisory network. Available from: http://icanresearch.org/wp-content/uploads/2018/08/compressed2018.summary.pdf. EMEUNET. (2018). Report of the EULAR/EMEUNET Ambassador Programme 2018. Emerging EULAR Network. Available from: http://emeunet.eular.org/myUploadData/files/report_of_the_eular_ambassador_programme_2018.pdf. EMEUNET. (2018). EMEUNEWS EULAR Do Not Miss: EULAR 2018. Emerging EULAR Network. Available from: http://emeunet.eular.org/myUploadData/files/eular_2018_dnm_issue.pdf. WEGO Health. (2018). 2018 WEGO Health Awards. WEGO Health. Available from: http://youtu.be/hkXZ7qXm9X8. Howson, N. (2018). Health Tweet Feast 16-22 April – join in and tweet! University of Leeds, Faculty of Medicine and Health, School of Healthcare. Available from: http://medhealth.leeds.ac.uk/news/article/1400/health_tweet_feast_16-22_april-join_in_and_tweet. National Institute for Health Research. (2018). Patient research ambassador initiative newsletter (issue 2). NIHR Clinical Research Network. Available from: http://mailchi.mp/5fd5882a97ff/patient-research-ambassadors-initiative-issue-2?e=827c475173. Evidence-based Nursing. (2018). Self harm with young people. Storify. Available from: http://storify.com/EBN_BMJ/self-harm-with-young-people. CreakyJoints. (2018). #CreakyChats Research and Chronic Diseases. Storify. Available from: http://storify.com/CreakyJoints/creakychats-research-and-chronic-diseases. Maddocks, L. & Palmer-Cooper, E. (2018). INVOLVE at 21. NIHR CLAHRC Oxford and the Nuffield Department of Primary Care Health Services, University of Oxford PPI Pulse. Available from: http://indd.adobe.com/view/e962da3b-58e0-470c-8d49-a8fd8c205690. Chronically Academic. (2018). Newsletter 01/18: Meet our members! Chronically Academic. Available from: http://chronicallyacademic.org/index.php/en/. Scrafton, C. (2018). The Leibster Blogging Award – Simon R Stones nominations. FibroFlutters. Available from: http://fibroflutters.com/2018/01/19/the-leibster-blogging-award-simon-r-stones-nominations/. Flanagan, S. (2018). Past pupil Simon Stones nominated for the 2018 Shaw Trust Power List. St. Joseph’s R.C. High School & Sports College. Available from: http://www.facebook.com/StJosephsRCHS/posts/1712371195497004:0. Scrafton, C. (2018). #ChronicIllness morning post: A selection of online health related newspapers/magazines. FibroFlutters. Available from: http://fibroflutters.com/2018/01/15/chronicillness-morning-post-a-selection-of-online-health-related-newspapers-magazines-6/. Scrafton, C. (2018). Nomination > Liebster Award 2018. FibroFlutters. Available from: http://fibroflutters.com/2018/01/11/nomination-liebster-award-2018/. CreakyJoints. (2018). Sharing our CreakyTruths. Storify. Available from: http://storify.com/CreakyJoints/sharing-our-creakytruths. WEGO Health. (2017). Patient Leader #FollowFriday – December 29th. WEGO Health. Available from: http://www.wegohealth.com/2017/12/29/patient-leader-followfriday-december-29th/. WEGO Health. (2017). 6th Annual WEGO Health Awards Nominees, Finalists and Winners. Digital video for: 6th WEGO Health Awards. Available from: http://www.youtube.com/watch?v=8y5SRyRLv14. WEGO Health. (2017). 2017 WEGO Health Awards Winner Healthcare Collaborator: Patient. Digital video for: 6th WEGO Health Awards. Available from: http://www.youtube.com/watch?v=8373s5wa4Gg. WEGO Health. (2017). 2017 WEGO Health Awards Finalists Healthcare Collaborator: Patient. Digital video for: 6th WEGO Health Awards. Available from: http://www.youtube.com/watch?v=uB8mfwpgtWw. European League Against Rheumatism. (2017). EULAR Don’t Delay Connect Today individual campaign video Simon Stones. Digital video for: World Arthritis Day. Available from: http://www.youtube.com/watch?v=CrH_aW3ZRs0. European League Against Rheumatism. (2017). EULAR Campaign Don’t Delay, Connect Today #ConnectToday. Digital video for: World Arthritis Day. Available from: http://www.youtube.com/watch?v=4S8fiTGL7wo&t=46s. European League Against Rheumatism. (2017). Mr. Simon Stones, EULAR Young PARE working group member. Digital video for: EULAR’s 70th Anniversary. Available from: http://www.youtube.com/watch?v=JKEeh5mwYFo. Substance Misuse and Ageing Research Team (2017). @SMARTatUOB joins Twitter. University of Bedforshire. Available from: http://storify.com/SMARTatUOB/the-smart-team-joins-twitter. PenCLAHRC Evidence Synthesis Team. (2017). Evidence synthesis can be a slog – we need to INVOLVE children and young people! Evidence Synthesis Team. Available from: http://evidsynthteam.wordpress.com. NIHR CLAHRC North West London. (2017). CLAHRC NWL @ #InvolveAt21. NIHR CLAHRC North West London. Available from: http://storify.com/CLAHRC_NWL/clahrc-nwl-involveat21. INVOLVE. (2017). INVOLVE at 21 Conference. INVOLVE. Available from: http://storify.com/gillwren/involve-at-21-conference. Dolan, M. (2017). How chronic illnesses helped me discover my mission. Everyday Health. Available from: http://www.everydayhealth.com/psoriatic-arthritis/living-with/how-psoriatic-arthritis-helped-me-discover-my-mission/. Self Care Forum. (2017). Self Care Week 2017: Twitterchat. Self Care Forum. Available from: http://storify.com/SelfCareForum/self-care-week-2017-twitterchat. Boyd, P. (2017). 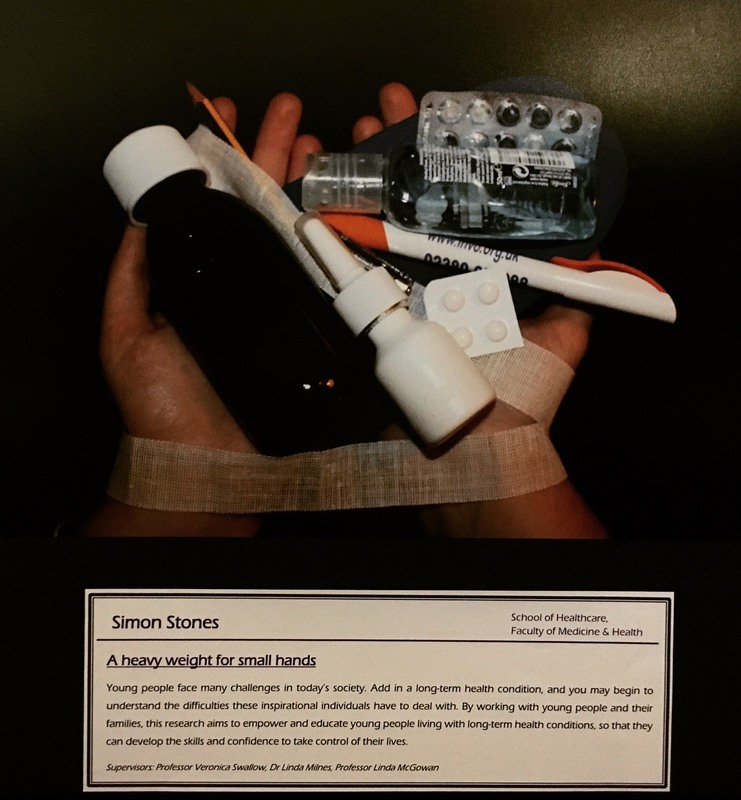 Young PARE Newsletter Edition 5: Simon Stones – Healthcare: Patient Collaborator, WEGO Health Award Winner. EULAR Young PARE. Available from: http://mailchi.mp/8335ab0be7ff/eular-young-pare-newsletter-edition-1470693?e=d6a874e016. Ricci, M. (2017). Being patient-centric: communication, co-creation and collaboration. PharmaPhorum. Available from: http://pharmaphorum.com/views-and-analysis/patient-centric-communication-co-creation-collaboration/. National Institute for Health Research. (2017). 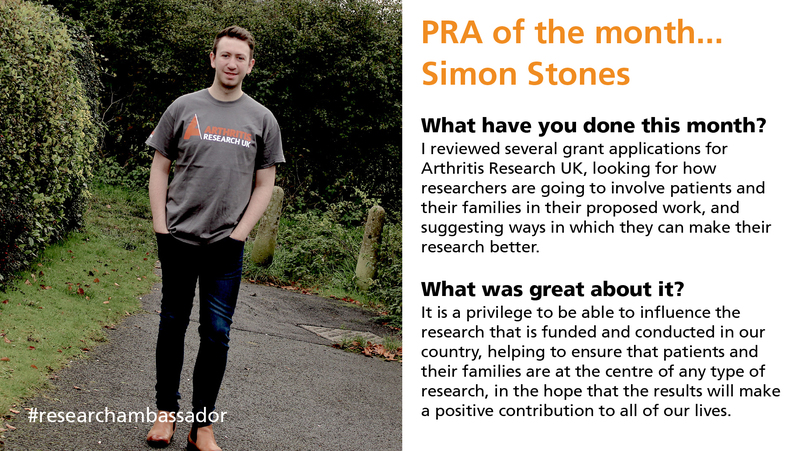 PRA of the month… Simon Stones. Digital image for: NIHR Patient Research Ambassador Initiative. Available from: https://simonstones.files.wordpress.com/2016/10/pra-of-the-month-simon-stones.jpg. WEGO Health. (2017). WEGO Health announces 16 winners of the 2017 WEGO Health Awards. WEGO Health. Available from: http://www.wegohealth.com/press_release/wego-health-announces-16-winners-2017-wego-health-awards/. Zimmerman, J. (2017). Your advice to new patient leaders. WEGO Health. Available from: http://www.wegohealth.com/2017/10/17/your-advice-to-new-patient-leaders/. Saul, R. (2017). Fibromyalgia could be ruining one in 20 lives, explains Bolton sufferer Simon Stones. Telegraph & Argus. Available from: http://www.thetelegraphandargus.co.uk/news/15542680.Lady_Gaga_shines_spotlight_on_little_known_chronic_pain_condition/. Saul, R. (2017). Fibromyalgia could be ruining one in 20 lives, explains Bolton sufferer Simon Stones. The Bolton News. Available from: http://www.theboltonnews.co.uk/news/15542680.Lady_Gaga_shines_spotlight_on_little_known_chronic_pain_condition/. National Institute for Health Research. (2017). Patient research ambassadors travel to Florida to promote young people’s involvement in research. National Institute for Health Research. Available from: http://www.nihr.ac.uk/news/patient-research-ambassadors-travel-to-florida-to-promote-young-peoples-involvement-in-research/6636. European Patients Forum. (2017). Young patient advocates learning about the virtues of leadership. European Patients Forum. Available from: http://www.eu-patient.eu/News/News/young-patient-advocates-learning-about-the-virtues-of-leadership/. Healthtalk.org. (2017). Long-term conditions: Advice to other young people. Seeing the GP. Available from: http://www.seeingthegp.co.uk/advice-young-long-term-condition. Healthtalk.org. (2017). Long-term conditions: What’s it like seeing a GP about a long-term problem? Seeing the GP. Available from: http://www.seeingthegp.co.uk/seeing-gp-long-term-conditions. Healthtalk.org. (2017). Long-term conditions: Making an appointment. Seeing the GP. Available from: http://www.seeingthegp.co.uk/making-gp-appointment-long. Healthtalk.org. (2017). Long-term conditions: Getting a diagnosis. Seeing the GP. Available from: http://www.seeingthegp.co.uk/diagnosis-long-term-condition. Olsder, W. (2017). People with arthritis/rheumatism in Europe (PARE) sessions. EMEUNEWS EULAR Highlights 18. Available from: http://emeunet.eular.org/myUploadData/files/EULAR_2017_Highlights_Issue.pdf. Flanagan, S. (2017). Past pupil Simon Stones. St. Joseph’s R.C. High School & Sports College. Available from: http://www.facebook.com/StJosephsRCHS/photos/a.432007456866724.104619.427822610618542/1491795594221233/. Davies, W. (2017). I look fine from the outside. Inspire by Arthritis Care. Available from: http://portfolio.cpl.co.uk/portfolio/inspire/2017-summer/cover/. Bowers, P. (2017). Week 13. Bath to Rome. Available from: http://www.bathtorome.co.uk/week-13/. Cloudy with a chance of pain. (2017). Cloudy’s patient partners discuss what the future holds for the study, Cloudy newsletter #51 – 9th February 2017. Cloudy with a chance of pain. Available from: https://simonstones.files.wordpress.com/2016/10/cloudy-with-a-chance-of-pain-newsletter-we-reconvene-our-cloudy-patient-partner-group.pdf. International Children’s Advisory Network. (2017). Why is iCAN important to you? Simon Stones, Generation R. iCAN Research. Available from: http://www.icanresearch.org, https://simonstones.files.wordpress.com/2016/10/ican-slider-homepage.png. Starling, B. (2016). New radio programme will inspire young children and families to think about medical research. Central Manchester University Hospitals NHS Foundation Trust Research and Innovation. Available from: http://research.cmft.nhs.uk/news-events/new-radio-programme-will-inspire-young-children-and-families-to-think-about-medical-research. National Institute for Health Research. (2016). Ambassador Stories: NIHR Clinical Research Network (CRN): Children, Simon Stones. NIHR Patient Research Ambassador Initiative. Available from: http://www.nihr.ac.uk/patients-and-public/how-to-join-in/patient-research-ambassadors/ambassador-stories.htm. Malone, A. (2016). 15 things people with arthritis want you to know. BuzzFeed. Available from: http://www.buzzfeed.com/ailbhemalone/15-things-people-with-arthritis-want-you-to-know?utm_term=.wqy2G3NBz#.iaNvLWKOx. Platform of Organisations of People with Rheumatic Diseases in Southern Europe. (2016). Report on the 2nd meeting of Young PARE. AGORA. Available from: http://www.agora-platform.eu/report-on-the-2nd-meeting-of-young-pare/. Fenn, C. (2016). Speakers. Carion Fenn Foundation. Available from: http://www.carionfenn.org/speakers.html. Fenn, C. (2016). Ask The Experts. Carion Fenn Foundation Rare Disease Health and Wellness Expo. Available from:http://www.rarediseaseexpo.com/ask-the-expert-panel.html. Fenn, C. (2016). Rare disease health and wellness expo. ParentSource. Available from: http://www.parentsource.ca/events/rare-disease-health-and-wellness-expo.html. Arthritis and Musculoskeletal Alliance. (2016). FMA UK welcomes new trustee. ARMA. Available from: http://arma.uk.net/fma-uk-welcomes-new-trustee/. Prosser, L. (2016). Creative project invites young people with arthritis to develop products and technology to help improve their life. Central Manchester University Hospitals NHS Foundation Trust Research and Innovation. Available from: http://research.cmft.nhs.uk/news- events/creative-project-invites-young-people-with-arthritis-to-develop- products-and-technology-to-help-improve-their-life. World Arthritis Day. (2016). The future in your hands. World Arthritis Day. Available from: http://worldarthritisday.org/our-campaign. ReumaNet. (2016). Britse jongeman winnaar van de Stene Prijs. ReumaNet. Available from: http://www.reumanet.be/britse-jongeman-winnaar-van-de-stene-prijs. Goyens, C. (2016). Edgar Stene prijs 2016 – Part 2 de Europese winnaar. Wolf and the city. Available from: http://wolfandthecity.blogspot.co.uk/2016/03/edgar-stene-prijs-2016-part-2-de.html. Deutsche Rheuma-Liga. (2016). Stene preis gewinner 2016: Das leben voll auskosten. Deutsche Rheuma-Liga. Available from: http://www.rheuma-liga.de/aktivitaeten/international/stene-preis/stene-preis-gewinner-2016/. Deutsche Rheuma-Liga. (2016). Edgar Stene preis. Deutsche Rheuma-Liga. Available from: http://www.rheuma-liga.de/stene-preis/. Liga Portuguesa Contra as Doenças Reumáticas. (2016). Prémio Edgar Stene 2016. LPCDR. Available from: http://www.lpcdr.org.pt/noticias-eventos/273-premio-edgar-stene-2016-portugal. Youth-R-Well.com. (2016). Winnend essay Edgar Stene prize. Youth-R-Well.com. Available from: http://www.youth-r-well.com/nieuws-mobile/360-winnend-essay-edgar-stene-prize. Lupus Europe. (2016). Stene prize. Lupus Europe. Available from: http://lupus-europe-blog.org/2016/06/28/stene-prize/. National Rheumatoid Arthritis Society. (2016). Edgar Stene prize. NRAS. Available from: http://www.nras.org.uk/edgar-stene-prize-entries. Scleroderma and Raynaud’s UK. (2016). National event in London. SRUK. Available from: http://www.sruk.co.uk/about-us/news/national-event-london/. EULAR. (2016). Digital health interventions boost self-care in chronically ill. EULAR 2016 Congress News Thursday Edition: 6. Available from: https://simonstones.files.wordpress.com/2016/10/thursdaylowres_web.pdf. EULAR. (2016). Stene Prize: Taking action despite life’s challenges. EULAR 2016 Congress News Friday/Saturday Edition: 4. Available from: https://simonstones.files.wordpress.com/2016/10/eular-2016-congress-news-friday-saturday.pdf. EULAR Standing Committee of PARE. (2016). Edgar Stene Prize 2016 goes to the United Kingdom. EULAR Breakthrough 11: 8. Available from: http://www.eular.org/myUploadData/files/EULAR_BREAKTHROUGH_Newsletter_Issue_11_ONLINE.pdf. Arthritis and Musculoskeletal Alliance. (2016). Edgar Stene prize 2016 UK winner. ARMA. Available from: http://arma.uk.net/edgar-stene-prize-2016-uk-winner/. EULAR Standing Committee of PARE. (2016). 2016 winner of the Stene prize: Simon Stones, UK. EULAR. Available from: http://www.eular.org/pare_stene_prize.cfm. Stones, S.R. (2016). Simon Stones: Consumer health advocate and researcher in the UK. The Huffington Post. Available from: http://www.huffingtonpost.com/author/simon-stones-. The Conference Forum. (2016). Disrupting clinical trials Europe speakers: Simon Stones. The Conference Forum. Available from: http://theconferenceforum.org/conferences/dpharm-europe/speakers/simon-stones/. EULAR Standing Committee of PARE. (2016). Social media taken by storm High 5 for World Arthritis Day 2015! EULAR e-Breakthrough 11: 6. Available from: http://www.eular.org/myUploadData/files/eBreakthrough%20issue%2011%20Jan%202016%20FINAL.pdf. National Institute for Health Research. (2016). Simon Stones, Research Ambassador. Digital video for: NIHR Patient Research Ambassador Initiative. Available from: http://www.youtube.com/watch?v=MuxCy44pkm8. Arthritis Research UK. (2015). Growing up with arthritis: Simon’s journey to finding a career. Digital video for: Arthritis Research UK Campaigns. Available from: http://www.youtube.com/watch?v=9c91L6_7_DU. Everett, S. (2015). Arthritis in adolescence: dispelling the myths. People & Places. Available from: http://peopleandplaces.me/2015/05/02/arthritis-in-adolesence-dispelling-the-myths/. Everett, S. (2015). Arthritis in adolescence: dispelling the myths. Buzz. Available from: http://buzz.bournemouth.ac.uk/2015/04/arthritis-in-adolescence/. Batchelor, S. (2015). Inspirational video stating why research matters to children and young people. HannahBatchelor.com. Available from: http://hannahbatchelor.com/2015/05/15/inspirational-video-stating-why-research-matters-to-children-and-young-people/. The University of Manchester. (2015). Meet the 2015 winners. The University of Manchester. Available from: http://www.socialresponsibility.manchester.ac.uk/get-involved/awards/meet-the-2015-winners/. The University of Manchester. (2015). Award winners and highly commended 2015. The University of Manchester. Available from: http://www.socialresponsibility.manchester.ac.uk/get-involved/awards/award-winners-and-highly-commended-2015/. Grew, T. & Stones, S.R. (2015). This is my story – animation and more children and young people share their experiences of being involved in research. NIHR INVOLVE. Available from: http://www.invo.org.uk/find-out-more/getting-involved/public-information-pack-whiteboard/. Patients Included. (2014). Signatories. Patients Included Charters. Available from: http://patientsincluded.org/conferences/conference-signatories/. McCoy, N. (2014). Young arthritis sufferer develops app to help children battling the condition. Salus Digital. Available from: http://salusdigital.net/young-arthritis-sufferer-develops-app-help-children-battling-condition/. Hall, A., Stones, S.R. & Swallow, V. (2014). Developing mobile applications for and with young people with long-term conditions learning to share their health-care with professionals: A young person and family-led approach. NIHR INVOLVE. Available from: http://www.invo.org.uk/posttypeconference/developing-mobile-applications-for-and-with-young-people-with-long-term-conditions-learning-to-share-their-health-care-with-professionals-a-young-person-and-family-led-approach/. Dobson, C. (2014). Young arthritis sufferer develops app to help children battling the condition. The Bolton News. Available from: http://www.theboltonnews.co.uk/news/11430711.young_arthritis_sufferer_ develops_app_to_help_children_battling_the_condition/. Dobson, C. (2014). I won’t let Crohn’s disease stop me leading a normal life. The Bolton News. Available from: http://www.theboltonnews.co.uk/news/11338135._I_won_t_let_Crohn_s_di sease_stop_me_leading_a_normal_life_/. De Graaf, M. (2013). Manchester scientists offer new hope to young arthritis victims. Manchester Evening News. Available from: http://www.manchestereveningnews.co.uk/news/health/manchester-scientists-offer-new-hope-2994232. Chaudhari, S. (2010). A remarkable young man. The Bolton News. Available from: http://www.theboltonnews.co.uk/news/8351323.A_remarkable_young_man/. Lavender, J. (2005). Can you help our Simon? Bolton Evening News. Available from: http://www.theboltonnews.co.uk/news/5785569.Can_you_help_our_Simon _/. Stones, S.R. (2017). Standards and recommendations for the development, evaluation and implementation of smartphone applications for young people aged 10 to 24 with rheumatic and musculoskeletal diseases: a scoping review of empirical research and an exploratory sequential mixed methods study proposal. Unpublished article for: HECS5238M Mixed Methods Research, 10 May 2017. Stones, S.R. (2017). A critical appraisal of three qualitative studies exploring the needs, experiences and motivations of children and young people with long-term conditions regarding self-management. Unpublished article for: HECS5237M Introduction to Qualitative Research Methods, 12 January 2017. Stones, S.R. (2016). Kids get arthritis too. Unpublished article for: BIOL31230 Science Media Project, 28 March 2016. Stones, S.R. (2016). Innate immunity in the brain in health and disease. Unpublished article for: BIOL31612 Neuroinflammation in Health and Disease, 08 March 2016. Stones, S.R. (2016). Safety pharmacology and approaches used to assess cardiovascular and neurological safety of candidate drugs. Unpublished article for: BIOL31602 Toxins, Toxicants and Toxicity, 05 March 2016. Stones, S.R. (2016). Legislation regarding the use of human embryonic stem cells for research. Unpublished article for: BIOL30000 Academic Tutorials, 04 March 2016. Stones, S.R. (2016). Severe combined immunodeficiency. Unpublished article for: BIOL31802 Immune Response and Disease, 22 February 2016. Stones, S.R. (2016). Explanation of the CRISPR/Cas9 system, and its role in editing genomes. Unpublished article for: BIOL30000 Academic Tutorials, 19 February 2016. Stones, S.R. (2016). The beneficial and detrimental effects of the immune system. Unpublished article for: BIOL30000 Academic Tutorials, 05 February 2016. Stones, S.R. (2015). The problematic clinical diagnosis of Cushing’s Syndrome. Unpublished article for: BIOL31751 Advanced Endocrinology, 03 December 2015. Stones, S.R. (2015). Clinical diagnosis of secondary hyperparathyroidism. Unpublished article for: BIOL31751 Advanced Endocrinology, 03 December 2015. Stones, S.R. (2015). The role of interleukin-6 in the pathogenesis of systemic juvenile idiopathic arthritis. Unpublished article for: BIOL30101 Literature Review, 26 November 2015. Stones, S.R. (2015). Contrast and comparison of T cell and B cell receptors. Unpublished article for: BIOL31371 Advanced Immunology, 28 October 2015. Stones, S.R. (2015). The role of the microbiota in human health. Unpublished article for: BIOL30000 Academic Tutorials, 20 October 2015. Stones, S.R., Becerra, S. & Bull, S. (2015). Living with rheumatoid arthritis: a descriptive study of patient experiences and attitudes towards the pharmaceutical industry. Unpublished article for: BIOL40000 Placement Report, 04 October 2015. Stones, S.R. (2014). Cellular mechanisms and treatment of osteoarthritis. Unpublished article for: BIOL21092 Dissertation, 19 March 2014. Stones, S.R. (2014). Urinary drug metabolite testing: paracetamol metabolism. Unpublished article for: BIOL200902 Clinical Sciences Research Module, 15 March 2014. Stones, S.R. (2014). The role of glutamine in superoxide production and the expression of p47phox, p22phox, and gp91phox in rat neutrophils. Unpublished article for: BIOL20000 Academic Tutorials, 18 February 2014. Stones, S.R. (2013). Effects of ethanol on performance and their relationship to breath concentration. Unpublished article for: BIOL21071 Physiology and Biomedical Sciences Experimental Design Module, 11 December 2013. Stones, S.R. (2013). The anti-inflammatory effects of cortisol. Unpublished article for: BIOL20000 Academic Tutorials, 23 November 2013. Stones, S.R. (2013). Public-private partnerships are an important tool for realising the benefits of research and should be encouraged. Unpublished article for: BIOL20000 Academic Tutorials, 18 November 2013. Stones, S.R. (2013). Examining the effects of Darapladib on atherosclerotic lesions and cytokine levels. Unpublished article for: BIOL20000 Academic Tutorials, 15 November 2013. Stones, S.R. (2013). JD-1 cell line use. Unpublished article for: BIOL20000 Academic Tutorials, 28 October 2013. Stones, S.R. (2013). Effect of cigarette smoking on levels of bioavailable testosterone in healthy men. Unpublished article for: BIOL20000 Academic Tutorials, 28 September 2013. Stones, S.R. (2013). Guinea-pig ileum: concentration-response relationship and competitive antagonism. Unpublished article for: BIOL10402 Introduction to Experimental Biology, 23 April 2013. Costello, S., Edwards, O., Heeney, N., Nelson, J., Owen, E., Rosher, C. & Stones, S.R. (2013). From grey to green. Unpublished article for: BIOL10000 Academic Tutorials, 21 March 2013. Stones, S.R. (2013). Animal pharm – the ethics of animal experiments. Unpublished article for: BIOL10000 Academic Tutorials, 17 March 2013. Stones, S.R. (2012). How are memories received? Unpublished article for: BIOL10000 Academic Tutorials, 23 November 2012. Stones, S.R. (2012). How the retina works. Unpublished article for: BIOL10000 Academic Tutorials, 22 October 2012. Stones, S.R. (2012). What right do we have to intervene in natural life processes? Where are the boundaries and who decides them? Unpublished article for: BIOL10000 Academic Tutorials, 22 September 2012. Stones, S.R. (2017). STEM Talk: What is it like to study a science degree at university? Unpublished oral presentation at: St. John Rigby College, 23 May 2017, Wigan, England, United Kingdom. Stones, S.R. (2016). Molecular biology of cancer: A brief overview of hallmarks of tumourigenesis. Unpublished oral presentation for: BIOL30000 Academic Tutorials, 25 April 2016, Manchester, England, United Kingdom. Stones, S.R. (2016). Juvenile idiopathic arthritis: It’s not just an old person’s disease. Unpublished oral presentation for: BIOL30000 Academic Tutorials, 18 April 2016, Manchester, England, United Kingdom. Stones, S.R. (2016). Juvenile idiopathic arthritis: It’s not just an old person’s disease. Unpublished oral presentation at: The University of Manchester Centre for Musculoskeletal Research Group Seminar, 13 March 2016, Manchester, England, United Kingdom. Stones, S.R. (2016). Juvenile idiopathic arthritis: It’s not just an old person’s disease. Unpublished oral presentation at: The University of Manchester Immunology Group Meeting, 13 March 2016, Manchester, England, United Kingdom. Stones, S.R. (2015). STEM Talk: What can you do to be the best? Unpublished oral presentation at: St. Joseph’s High School, 11 December 2015, Bolton, England, United Kingdom. Stones, S.R. (2015). STEM Talk: What can you do with A-level Biology? Unpublished oral presentation at: Winstanley College, 09 November 2015, Wigan, England, United Kingdom. Stones, S.R. (2015). The role of interleukin-6 in the pathogenesis of systemic juvenile idiopathic arthritis. Unpublished oral presentation for: BIOL30101 Literature Review, 05 November 2015, Manchester, England, United Kingdom. Stones, S.R. (2015). Industrial experience placement with Double Helix Consulting. Unpublished oral presentation at: The University of Manchester Faculty of Life Sciences. 04 November 2015, Manchester, England, United Kingdom. Stones, S.R. (2015). Unravelling complexity, delivering clarity. Unpublished oral presentation at: The University of Manchester Faculty of Life Sciences. 19 September 2015, Manchester, England, United Kingdom. Bojanova, G., Kerrison, S. & Stones, S.R. (2014). Clinical drug development: Compound 128 pre-clinical testing. Unpublished poster presentation for: BIOL21302 Clinical Drug Development, 01 May 2014, Manchester, England, United Kingdom. Stones, S.R. (2014). Interleukin-1β processing and secretion. Unpublished poster presentation for: BIOL20000 Academic Tutorials, 25 February 2014, Manchester, England, United Kingdom. Stones, S.R. (2013). Should science be regulated at the international level? Unpublished oral presentation for: BIOL20000 Academic Tutorials, 08 December 2013, Manchester, England, United Kingdom. Stones, S.R. (2013). Low testosterone level predicts prostate cancer in re- biopsy in patients with high grade prostatic intraepithelial neoplasia. Unpublished oral presentation for: BIOL20000 Academic Tutorials, 05 October 2013, Manchester, England, United Kingdom. Costello, S., Edwards, O., Heeney, N., Nelson, J., Owen, E., Rosher, C. & Stones, S.R. (2013). Blogging for biodiversity. Unpublished oral presentation for: BIOL10000 Academic Tutorials, 28 April 2013, Manchester, England, United Kingdom. Costello, S., Edwards, O., Heeney, N., Nelson, J., Owen, E., Rosher, C. & Stones, S.R. (2012). Silent assassins: Cone snails. Unpublished poster presentation for: BIOL10000 Academic Tutorials, 04 December 2012, Manchester, England, United Kingdom. Stones, S.R. (2012). The war against bacterial resistance. Unpublished oral presentation for: BIOL10000 Academic Tutorials, 24 November 2012, Manchester, England, United Kingdom.